BRUSSELS, Belgium -- Ukrainian President Petro Poroshenko signed an association agreement with the European Union on Friday, the same deal whose reversal set off a crisis in the nation. 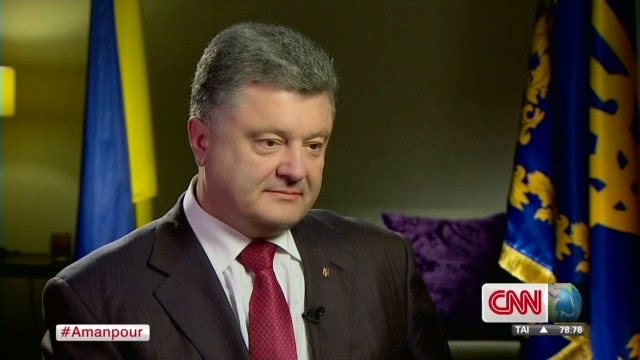 President Petro Poroshenko being interviewed by CNN's Christiane Amanpour. His predecessor's decision to shun the deal last year and work with Russia instead unleashed deadly strife that led to the ouster of the nation's President, the loss of Crimea and a pro-Russia separatist rebellion. Sealing the deal may be the second-most important moment in Ukraine's history, Poroshenko said, after its independence from Russia. Poroshenko said the signing "shows how dramatically things can change in a short time, if the will of the people is strong enough." And he paid tribute, on what he described as a "great day" in the nation's history, to Ukrainians who lost their lives when protests over closer ties with Europe turned bloody. "The document we will sign today is not just political and economic, it is a symbol of faith and unbreakable will," he said. "It is a tribute to people who gave their lives and health to make this moment happen and it is the strongest reminder that today's Europe must and will be about people's determination to live in a better and safer world." Poroshenko said that in signing the association agreement, he was making the unilateral statement that his country has underlined its choice of future membership in the European Union. And he signaled to Russia that its efforts to undermine the closer unification of Europe would fail in the face of Ukraine's determination to pursue its European dreams. He used the same pen intended for use in November, before former President Viktor Yanukovych turned his back on the agreement in favor of closer ties with Moscow. Kremlin spokesman Dmitry Peskov said on Russian state TV that signature of the agreement is a "sovereign right" but that "Russia will undertake its measures." The EU-Ukraine Association Agreement calls for a free trade zone and for Ukraine to adhere to European values such as democracy and human rights. It will allow for the country to participate in common border protection and security processes. In remarks before the signing, the president of the European Council, Herman Van Rompuy, also remembered those who died in Ukraine. "In Kiev and elsewhere, people gave their lives for this closer link to the European Union," he said. "We will not forget this." Van Rompuy said that closer political and economic ties would bring greater security, stability and prosperity to Ukraine and the two other former Soviet states also signing EU Association Agreements on Friday, Georgia and Moldova. "Our joint goal is your full integration into the market of the European Union," Van Rompuy told the three leaders, adding that they must push forward with necessary reforms. He also expressed the solidarity of the European Union with the three nations in the face of Ukraine's "very difficult" security situation, and the "uncertainties" looming over Georgia and Moldova's relationships with Russia. At the same time, he stressed that Russia had nothing to fear from those nations' closer ties with Europe, adding that the European Union would engage with Russia to work for peace. As Ukraine's government works to quell the violence in the country's east, Poroshenko said Thursday that negotiations with Russian separatists in that area will continue Friday, the day his unilaterally declared cease-fire expires. Peace is possible if Russian President Vladimir Putin is in the right mood, he said. "Sometimes, the position of Mr. Putin is quite pragmatic, sometimes it is very emotional," Poroshenko told CNN's Christiane Amanpour on Thursday in an exclusive interview. "I just try to find out the time when he is more pragmatic than emotional." The talks are intended to end fighting that threatens to escalate into a broader conflict. "I am optimistic and I'm thinking that within a few weeks, maybe months, we can have a deal to establish peace," Poroshenko said from Brussels. Putin has agreed to negotiations that will include an EU representative, Poroshenko said. "We do not expect any immediate negative reaction," he said. "I'm ready to make a peace deal with anybody," he said. He is also ready to fight if necessary, but said, "I hate the idea not to use the last opportunity to bring the peace to the region." At the same time, he made clear that in his mind, the Russian annexation of Crimea -- which has an ethnic Russian majority -- cannot stand. Crimea is Ukrainian, he said. He made the same point in his remarks Friday, when he said that "all Ukraine, including Crimea" will be associated with the European Union. Russia and Ukraine have been engaged in a tense standoff since the annexation in March, when Russia also massed troops along its western border with Ukraine. Despite Poroshenko's cease-fire declared last week, violence continues. On Thursday, a Ukrainian national guard base came under attack in Donetsk, Anti-Terrorist Operation unit spokesman Vladislav Seleznyov said. Ukrainian troops were able to repel the attack, but were bracing for another assault. Two days earlier, Ukrainian authorities said pro-Russia militants shot down a military helicopter in eastern Ukraine, killing nine. Friday's negotiations must show some progress before his unilateral cease-fire expires at the end of the day, the President said. He seeks a commitment to negotiations, the release of hostages, a mutual cease-fire and the withdrawal of Russian-backed forces from Ukraine. "All the troops on Ukrainian territory are Russian, they are Russian citizens," he alleged, adding that separatist leaders were from the Russian secret service. "If that continues, it is a real war." Putin has shown signs of detente. On Wednesday, Russia's upper house of parliament voted, at his request, to revoke the President's right to use troops in Ukraine. Poroshenko said the Russian President recently vowed not to take economic revenge for the move of the former Soviet satellite state toward the West. Quote: " Участники акции требуют в начале реформировать ЖКХ, наладить механизмы прозрачного образования тарифов, повысить зарплаты, а уже потом поднимать тарифы." This quote sounds as a reasonable demand for which Ukrainian Government should keep their earth open. Perhaps such practice could become popular for the future.